Let’s talk about industry problems and solutions. There can be little doubt about the importance of bulk materials handling to the mining industry, and by extension more generally to the success of Australia’s processing industries on the global scale. In current market conditions, the focus is increasingly on optimization and productivity of existing plant with a view to extracting the most from current assets. It follows then that we can state there is an industry need, right now, to find efficient and timely methods for optimizing current plant productivity. The following commentary centers on this industry problems and solutions and the rise of numerical modeling as a viable means of finding a solution to bulk solids handling problems. I have been an Engineer with TUNRA for over 10 years, and in this time I’ve enjoyed a front row seat to experience the evolution of Discrete Element Modelling (DEM) and its use in solving industrial problems in the material handling field. From this unique perspective, there appears to be a cycle to the application of this analysis tool. Note the terminology here; DEM is an analysis tool and NOT a standalone solution. The technique of DEM has existed for many years in academia. Commonly referenced early works are from Cundall and Strack (1979), however, DEM was sitting in wait for the computing world to catch-up before it could be applied to large-scale industry problems. In the early stages, DEM was picked up by many and applied in some cases without a thorough understanding of the contact mechanics. For this reason, there were instances of this tool being used to design solutions that over promised and under delivered. These examples gave rise to detractors of the method who did not see DEM as a realistic method of design. In these cases, the analysis tool of DEM was being judged as being an inferior analysis tool, when in fact it should have been judged on its poor application. Fortunately, DEM is currently experiencing a second wind as more users are applying it appropriately. As a result, DEM has matured into a developed and viable technology. Additionally, the recent advances in DEM software, such as Rocky DEM, allow engineers to simulate real particle shapes enabling even more realistic results. To aid in this process there have been many research and education campaigns undertaken by many groups (including ours) to allow the users of the technology to gain a better understanding of the technique, its limitations, and assumptions. This brief overview sets the scene for the following discussion. It is worth noting that for the true theorist, simulations (numerical solution) are viewed as an imperfect solution. In fact, there is a statement that is sometimes used in Academic circles that cuts to this point exactly; “Simulations provide a weak solution from a weak mind”. However, in my experience, being in a role that directly engages with industry, means we are often faced with finding the optimal solution within a set of design constraints (time and budget), not necessarily a perfect solution we could strive for where dollars and production deadlines are not a concern. This leads to an opposing argument I’ve also heard thrown around: “Those that live in the academic world are free from the constraints of solving real problems”. I don’t purport one argument over the other; neither is true: some of the best innovators in the world have come from academic roots. My position is that solving industry problems is difficult, complex and in some cases underestimated. On top of obvious time and budget constraints, there are so many real-world variables to the problems we are called on to solve that, if looked at in a scientific manner, would be eliminated from the problem by a set of controls. The observation from this is that in most cases research lags industry. This, in turn, alludes to a very important relationship where the industry needs research to provide advanced solutions and research needs industry for direction and relevance. This ties in with my earlier comment about TUNRA Bulk Solids being in a unique position. We have built a successful business in its own right that, in addition to solving industry problems, has been funding University research for over 43 years. In performing this essential and unique function of interfacing industry and academia, to the benefit of both, TUNRA has bridged the gaps between industry projects and academic research. The success of TUNRA and its value to both industry and academia is largely a result of the vision of bulk materials handling pioneer Emeritus Professor Alan Roberts. Coming from the position of needing to provide solutions to industry in a timely manner (i.e. now! ), and not having the timeframe of a 3-year research program, it is of critical importance that the method being used to design the solution is fully understood. This includes knowledge of the limitations and assumptions of the tool – I’ll come back to this point shortly. It is also important when a numerical modeling tool is being used, such as DEM, that it is supported by a more traditional approach (where possible). These approaches might range from a ‘back of the envelope’ calculation based on a mass/volume balance, to a more in-depth method such as the application of theoretical, classical analysis. It should also be recognized that in the case of DEM, as with all modeling approaches, the quality of the outputs are limited by the quality of the inputs. This can be difficult for DEM as it models real bulk materials, which are for the most part inhomogeneous and not easily characterized. At TUNRA we offset this challenge by undertaking rigorous material testing that seeks to classify bulk material behaviors and characteristics against a set of criteria – commonly bulk density, particle size and shape, material strength and cohesion, and wall friction and adhesion. However, there is still the step from physical test results to sometimes non-physical DEM parameters – this step is known as calibration. Again reflecting on the symbiotic relationship between industry and academic research, there are ongoing research activities in our group and across the world that continue to refine this process. It is clear that the success of numerical modeling to bulk materials handling problems needs to be strongly linked with material testing. In terms of the successful application of numerical modeling to materials handling problems, there are a number of questions that must be answered to ensure a robust solution. The limitations of the method need to be taken into account to ensure that the solution is practical and offers value. Can we capture the correct failure mode? For materials to flow they must fail – is the failure mode by gravity alone or forced flow? Will the bulk material be failing internally or at a wall surface? What is the scale of the problem and can it be modeled with enough resolution? This includes both the scale of the geometry as well as the scale of the particles. For commercial scale problems, best in class DEM codes as Rocky DEM provides the ability to simulate the exact number of particles in the exact same size distributions and shape representations using multi-GPUs. 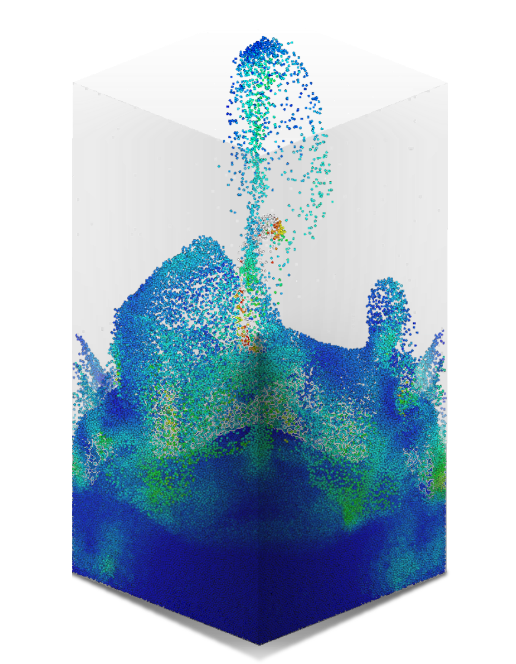 Figure 2: Rocky DEM simulation snapshot of a commercial scale granulator showing 10 Million particles colored by their translational velocity. Image: Courtesy BMS. What is the tonnage? The trend is for higher tonnages (>20,000tph), can this be modeled with small enough particles? (again, resolution). Too small a tonnage can also be problematic in terms of resolving the particle scale adequately with respect to the burden height. Are the effects time-dependent? If so, how much simulation time would be needed to capture the behavior and is this reasonable? By addressing each of these questions we are ensuring that the application of DEM, and numerical modeling more broadly, will remain valuable in the bulk materials handling field. Given the history of DEM to materials handling, it is important that we all cast a critical eye over any modeling work and I encourage all involved to ask questions about the application and have a robust discussion about the limitations of the method with respect to the application being studied. Looking forward, I am reminded of an excellent presentation at the 2016 conference on Discrete Element Modelling (Qiu, 216). The presentation was titled “DEM Simulations in Mining and Mineral Processing” and delivered by Dr. Xiangjun Qiu (reference). The presentation covered a range of topics, but the specific section I reflect on is the classification system for DEM problems. 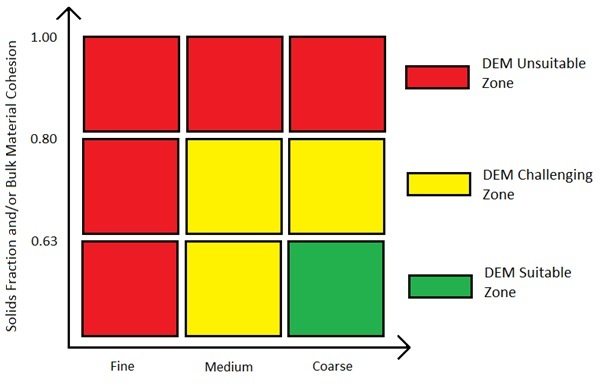 I have modified this classification system slightly and it appears in Figure 3 below. As you can see, the green section represents what I would call the “easy” DEM problems – bulk materials that are a course in nature and are relatively free-flowing. A typical application that might fit into this region would be the analysis/design of a transfer chute handling lump iron ore.
Vibrating screen – challenges of modeling a wide size range from 2-3mm up to 70-80mm of non-round particles; higher stiffness being needed for the small particles meaning smaller time steps; the large domain (>7m) and longer time period of simulation (> the 60s). 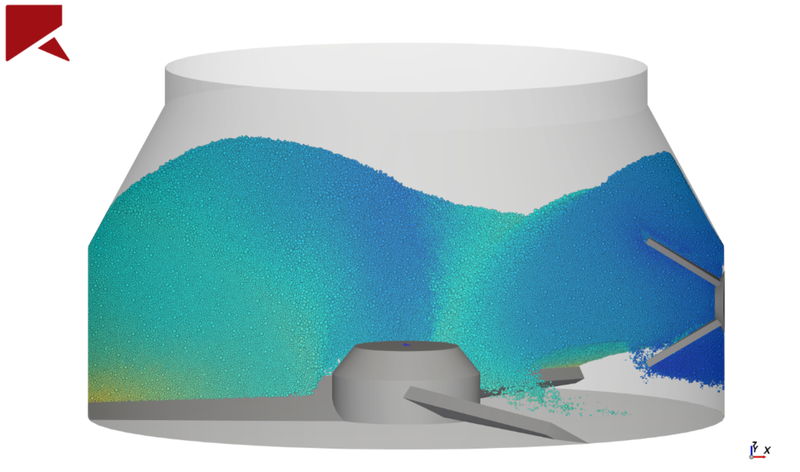 Silo quaking – challenges of large application (geometry) of train loading bin with complex phenomena; particles must be small enough for numerical robustness but large enough to allow reasonable time of simulations. Particle breakage – challenges of; non-round polyhedral particles used where high stiffness is needed; a wide range of particle sizes from 3-4mm to over 50mm; the large geometrical domain of over 30m in the vertical direction. Find out more about Particle Breakage here. The three problems listed above are examples of industry needs that can’t be entirely addressed by current research. There are scholarly papers published on all of these topics, however, there have not been adequate solutions presented that will allow us to solve these industry problems in detail. In time, these challenges will largely be overcome through increased computing resources, but the industry is demanding an answer now and through ongoing interaction with academia there is a pathway for the industry to drive the research. While the focus of this article has been on DEM, it can be equally applied to the other numerical modeling tools that are used in the bulk materials handling field. Tools such as Finite Element Analysis (FEA) and Computational Fluid Dynamics (CFD) are more mature technologies, however, their use in bulk material handling problems is still being developed, particularly in the applications where they are being coupled to DEM. Some of the recent evolution can be seen in the integration of Rocky DEM and ANSYS, using both 1-way and 2-way approaches. This multi-physics approach is the next area for growth and development in bulk materials handling to look at problems such as dust flow in transfer chutes, interactions between the bulk material and conveyor belt, as well as modeling slurry flow through a pipe or in an open flame. At TUNRA we are developing tools in each of these areas to be more equipped to help industry solve the increasingly complex set of problems. Now more than ever there need to be pathways for collaboration that allows the industry to continue to drive research to ensure it remains relevant – this is particularly true in the bulk materials handling field. 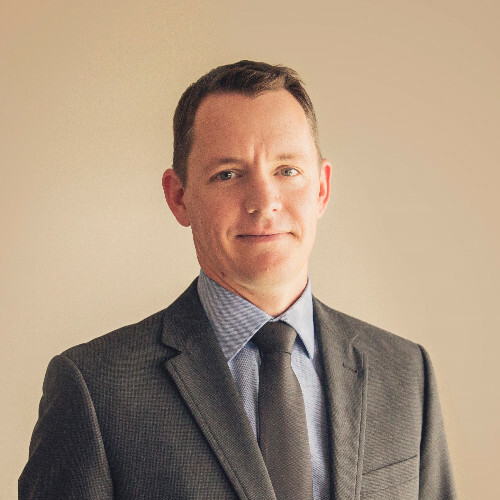 Dr Tim Donohue is employed as the Engineering Manager with TUNRA Bulk Solids and has been employed with TUNRA for almost 10 years. Prior to this, Tim completed 8 years studying at the University of Newcastle to obtain his BE (Mech) undergraduate degree and his PhD on the topic of porosity and permeability in porous materials. Tim’s current role with TUNRA allows an oversight into many consulting and research projects but also allows him to keep up to date with current analysis methods and technologies. Current research includes both CFD and DEM modelling with a focus on materials handling applications, however fundamental research into material calibration is also ongoing. Tim awarded the A.W. Roberts medal and also serves on the scientific committee of the International Conference Series on Discrete Element Methods.